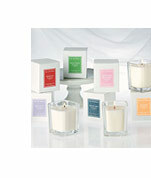 I really like Aromatique candles and have had nothing but praise for every candle I’ve tried. We have a department store close by me that carries this brand and every time I walk by the kiosk of candles, I have to smell them all. I haven’t smelled one scent that wasn’t authentic or strong. I love that and know I’ll always get a great scent throw with this brand. They’re pricy but worth it. This will finish up my series on Aromatiques Spa collection. They do have one new scent I haven’t tried that must have been added in the last year called “Clean Green”… which I may get to someday. 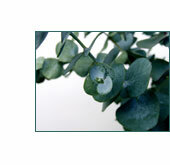 Eucalyptus was the latest scent I tried and like all the others… a very nice fragrance. I consider Aromatique a luxury line and definitely one of the better. Every candle I’ve tried from this company has been pretty true to description and very fragrant. They are on the semi-pricey side but if you happen to run across this line in a store, I think they’re worthy of purchase. You definitely get your money’s worth. 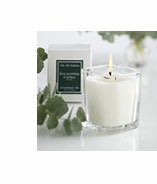 What Does My Eucalyptus Candle Look Like? My Eucalyptus candle is 5 ounces and came in a square box my candle fit in snugly. The candle itself is in a thick square glass. The wax color is white and my candle had one wick. These are very simple yet classic candles. How Did My Eucalyptus Candle Smell? I lit my candle early morning in my bedroom and very soon after (10 minutes maybe) I started to smell the fragrance. This candle gives a nice strong scent throw for the size, I was impressed with that. Aromatique doesn’t skimp on scent, that’s for sure. I think anyone who loves masculine, musky scents would like this fragrance because that’s what I truly thought it smelled like. I really enjoyed this candle. How did my Aromatique candle burn? On a scale of 1 to 10, my candles burn performance was about a 4. The wick kind of pooped out a few hours into burning it and started to tunnel. I had to use my wick dipper to push leftover wax into the melted wax pool so nothing was wasted. The candle never burned well even to the end. That’s actually unusual with Aromatique candles because they’ve always burned great for me. Maybe this one had a defective wick or something. This candle had an interesting fragrance and not at all what I expected. My experience burning Aromatique’s spa collection is that the majority fall into the soap/fresh/clean category and that’s exactly where I would put this one too. If I remember correctly, I burned their spa candles in my bathroom because all the scents seemed perfect there. I did enjoy this candle as it was a fresh & bright scent and one you can’t help but notice when you walk into the room it’s burning in. If you’re the fresh/clean type and you run across this brand, give them a try. I think you’ll like them. As far as how this candle burned, I truly believe that is not the norm with this brand. I’ve personally never had it happen before so I’m pretty confident yours will be fine. Have you tried this candle from Aromatique? Comment and rate it with us below… it’s super easy! Scent description for Aromatique's Eucalyptus Scented Candle- Soothe away the tensions of the day with the cleansing fragrance of eucalyptus.